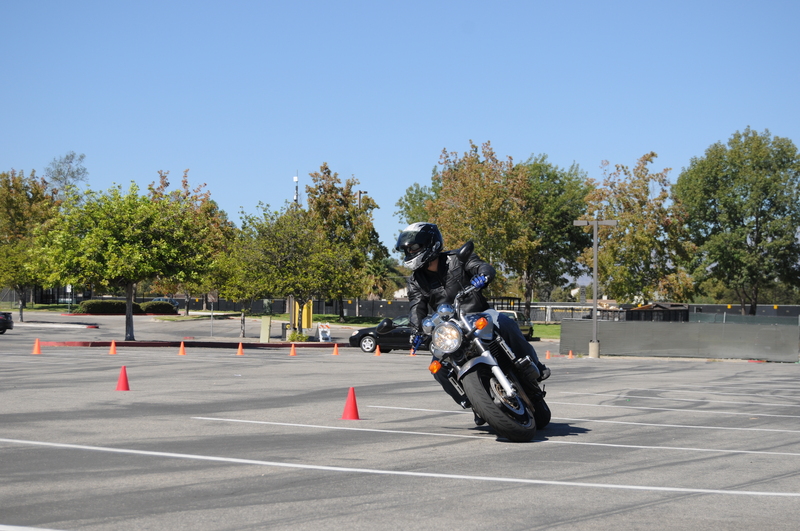 It was a really beautiful Satuday afternoon this past weekend and a great day to ride M Gymkhana®. We had a nice opportunity to welcome two new M Gymkhana® riders/members to the family. We got a little bit of a late start for the day but introduced the riders who were there to a few specific manuevers. After a quick review of the cones (colors/riding direction, etc…) we starting with a simple 5 coned fingers set-up. Joel Walta out of Buena Park who was well aquianted with gymkhana riding got right into the fingers course getting himself comfortable with the layout and traction of the tarmac. Jazmin Seivil out of Newport Beach who’s working on getting her M1 license got on course as well. First getting herself up to speed with the weight and feel of the Honda 916 Hornet that was riden. This was a bit different then the 350 she got her permit on. She was getting more comfortable with the throttle response, and push/pull technique required on a larger bike to get it to turn-in and get settled into a smooth arc of a turn. Look to news/updates for a continuation of the days activities….